In the last year, we’ve started doing a lot of muffins for breakfast. And now that fall is in the air (we had our temperature plunge by 20 degrees over the weekend!) it’s time to pull out all things Pumpkin Spice! 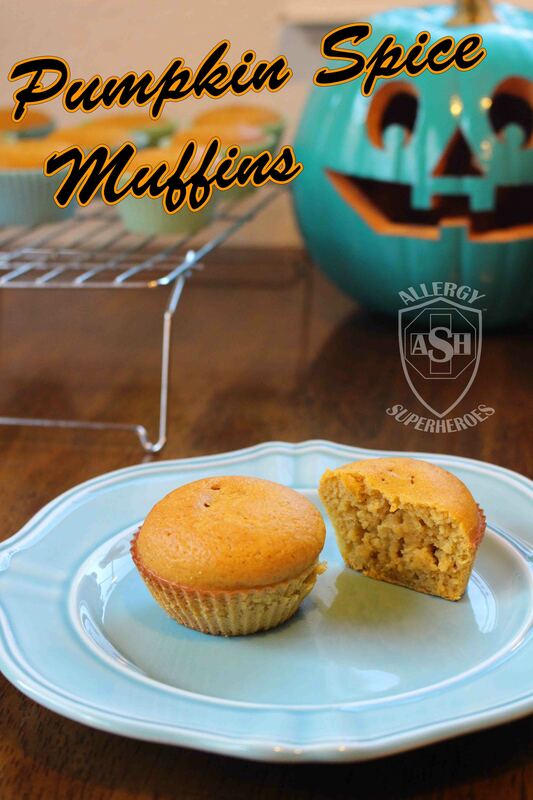 These delicious allergy-friendly muffins hit the spot on chilly autumn mornings! 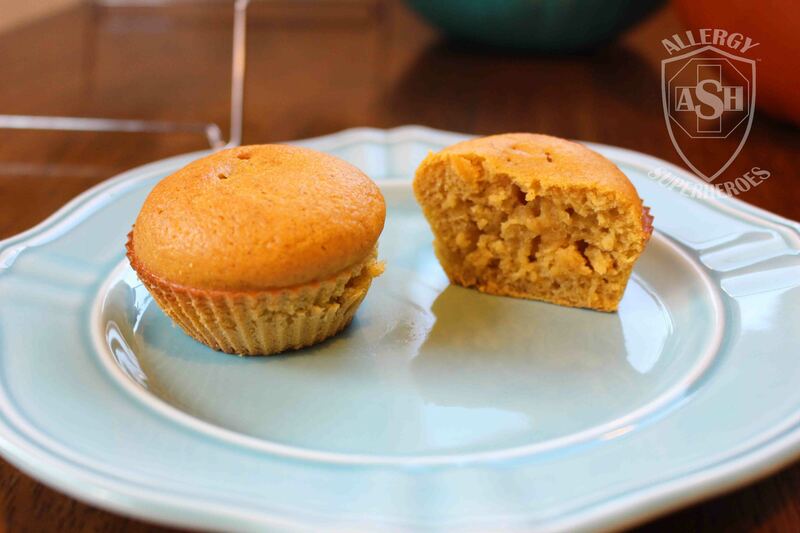 These delicious muffins make a perfect breakfast for fall. They'll go especially well with your pumpkin latte! Pour batter into 12 prepared muffin tins. Bake for 35-40 minutes, or until golden brown and a toothpick comes out clean. Contains wheat and corn. Free from peanut, tree nut, egg, dairy, soy, fish, shellfish, and seeds. I make all of my pumpkin recipes with homemade puree. I think it tastes much better this way! Learn my favorite method for pureeing your own pumpkins here! One of the things I like best about this recipe is that you can mix it all up in one bowl and not worry about dirtying many dishes. The batter is fairly thin and can be messy to pour into cups, though, so be careful. They definitely yield a delicious result! 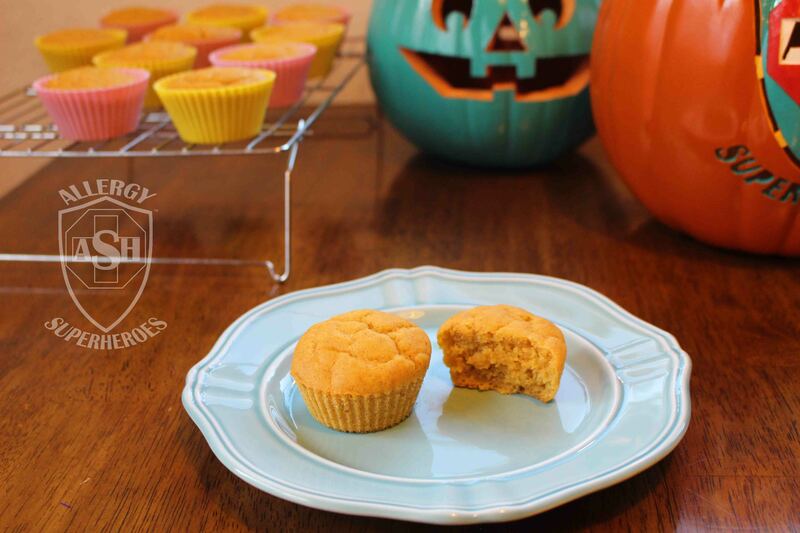 These muffins can be top 8 free, although gluten free flour + pumpkin = gumminess for me most of the time. I made two batches the other day, and the muffins below are gluten free. They look fine (though not as pretty as the regular ones) but they are fairly gummy/chewy on the inside. I imagine that the type of flour used could correct this, but I was just using a combination of several all-purpose mixes, because I had small amounts of several brands left to use up. If you know of a good brand that works well with pumpkin, let me know in the comments! Seasonal breakfast? Check! What will you be making taste like pumpkin this year? Me too, plus anything pumpkin-flavored! Thanks for stopping by! Me too! ‘Tis the season!